What a beautiful day today. 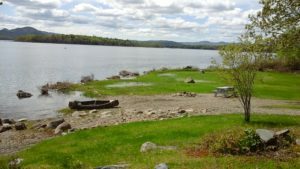 The lake water is finally receding and we almost have a lawn agajn. We are still not able to put out the dock but soon. Our quests this weekend are boating and fishing (one caught a nice 17 inch trout last night) and since our trails opened yesterday, many are out enjoying the ATV trails. Of course, we are also remembering those lost while serving our country. God bless. This year, Jackmans 4th of July events will take place on July 3rd. Starting at 4pm, Locals and visitors will line up on Main street to watch the parade. Dot, who has been organizing the parade the past few years, is still trying to find a marching band. Last I heard, she had no luck. BUT local residents and businesses all join in the fun making floats in hopes to win a prize. At 9pm, everyone will gather at the town hall field for some great fireworks. Bucky Lewis made his second visit to Jackman this weekend and the show was even better. 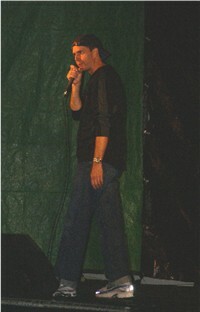 Some things were the same but being in a more intimate environment, plus being at a pub, made it all more fun. Below is a little collage I made of the show. Great fun! WOW…there seems to be a lot of things going on around town this summer. Besides the regular annual events of horseshoe tournaments, ATV Jamboree, and 4th of July old fashioned fun, I just heard that the Sled Dog Club is trying to have a Cardboard Box Boat Race….I think in August. The Border Riders Club is trying to organize and ATV endurance Rally (similar to the Snowmobile 3 day race that took place in Canada this winter that 2 of our Jackman boys won) in the fall. Jackman is also supporting vets in various ways this summer with lodging and ATV discounts, the JMRRCOC 4th of July Float will be made in their honor, and various happenings for the disable vets also. Most events are on the JMRRCOC web site. Just click on the events page. 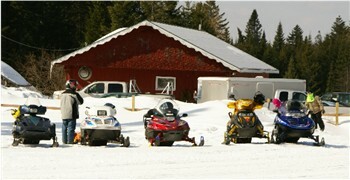 The sled dog races begin today and you will find detours around the clubhouse to snowmobile. But here is a shot of some riders who stopped into the Border Riders Clubhouse to warm up and get a bite to eat, and maybe catch a little bit of the races. Today-3-14 we rode out by Gander Brook to try and watch the sled dog races from there and while waiting I took a shot of the trails. EXCELLENT conditions to ride. Talk about an excited town. Our basketball team from Forest Hills School in Jackman has made it to the Western Regional Basketball Tournaments happening today at the Augusta Civic Center. This is the first time in 10 years that our team has gone this far. There are GO TIGERS signs all over town and I believe half of the residnets are in Augusta today to cheer them on. If you want to watch the game it will air on Maine PBS or Channel 10 (our local channel)today at 3PM. Start doing your SNOW DANCE!!! 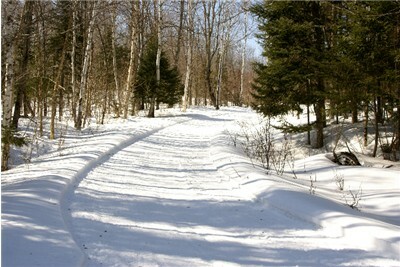 It is almost time to get out your sleds and come up to Jackman to ride the trails. This week, the Border Riders Club began their TRAIL FUND RAFFLE for 2009. Each ticket is $10.00 and there are daily winners which are posted on their website. Proceeds of the raffle go to the purchase of a new groomer. The Club does an excellent job in maintaining and grooming the trails in the region but they could use our help. Contact the Border Riders Club at www.borderridersclub.com/home_f1.html for more information on the raffle or if you would like to join or are able to come on up to help the club make the trails ready for the 2009 season. Remember the good old fashioned 4th of July celebrations we had as kids? That-s what it is like in Jackman this year. There were about 47 entries in the parade, including guests of Cozy Cove Cabins. Kevin, Celie and the Bissell family got together using whatever they could find to make a float and participate in the parade. The theme ended up being about summer fun including fishing, swimming, seashells, and ATVing. They even had a swimming pool on it. Plans are already being made for the float for next year. Then after the parade, the community enjoyed sitting at the town yard where there were games for kids, hot dogs, and popcorn and then the “family amazing race” sponsored by the Live to Learn Program. Family teams had to run a course they and the best time won. It looked really hard but all seemed to have a great time. Last night, the JMRRCOC hosted Bob Marley for a night of out loud laughter. We had a fantastic turnout and I believe coming to Jackman has given him a lot more material for the future. 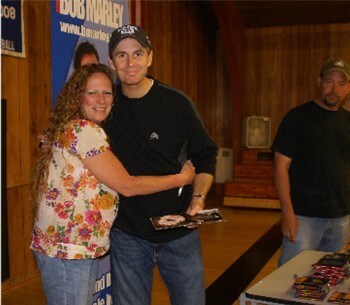 After the show, he hung around a while to meet people, sign tickets and CDs and give hugs. Cecilia, a guest staying with us, did not hesitate to get snapshot with him.